"I can't breathe" has become a rallying cry for people who have taken to the streets across the country in response to the death of Eric Garner at the hands of the NYC police six months ago, the death of an unarmed black teenager, Michael Brown in Ferguson, MO in August and, the death of a 12-year old black boy, Tamir Rice, at the hands of the police three days before Thanksgiving in Cleveland, OH. No less than President Barack Obama believes that the recent incidents evidence a systemic problem in the policing of communities of color in this country, and that the anger in black and brown communities towards the entire justice system is "grounded in reality". Police bias, based in large part on stereotypes, which are based faulty assumptions stemming from short interactions with those who supposedly represent a "race" or group, demonstrates how America's racial past continues to haunt the nation's present. You've heard them before. "Black males are lazy", or "Black males are threatening" or "Black males are all thugs", or "Black males are all athletes". Faulty assumptions by police spiral out of control into a continuous, dangerous phenomenon and represent a kind of ingrained lack of regard for black and brown life on the part of some in our criminal justice system. The death of unarmed black males -- and the refusal by grand juries to indict the officers involved -- reflects a pervasive, deep-seated reliance on stereotypes of black men. The stereotypes are powerful, and if acted on without reflecting on the vast body of one's knowledge and experience, will continue to lead to unintended and often-times deadly results. Whether we readily admit to it or not, we've all likely been guilty of making assumptions about a culture. Even if we don't say it out loud, we've perhaps thought about it. Sometimes, we even fall 'victim' to it. Hell, the first thing I think when I see a 6'8" young man in the airport is not Rhodes Scholar, but basketball player. I wonder whether the situation in Ferguson would have happened if blacks, who make up 60 percent of the population, had presented viable candidates for mayor, police chief and other city offices, and then exercised their right at the ballot box. While the demographics of the once majority (99 percent) town have clearly shifted, the town's form of government does not reflect the shift. The outrage behind the three recent killings of unarmed black men by the police may spur a movement that will force the country to confront the interlocked issues of race and policing. Black professional athletes, who generally avoid saying or getting involved in anything "black" for fear of getting "blackballed", have joined the effort. 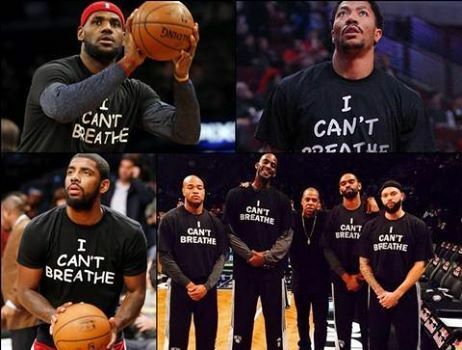 I think it's great that LeBron James, Derrick Rose and other pro athletes have taken a stand. With the shield of general public disgust and outrage protecting them, pro athletes took a similar stand when racial bias reared its ugly head with the public release of racially-tinged private comments made by former Clippers owner Donald Sterling and similar comments by former Hawks co-owner Bruce Levenson. But where is the follow up? Where are the demands for change? I would love to see black athletes, one of the most stereotyped populations on college campuses and among professionals, flex their considerable muscle to bring attention to and a response to the same racial bias and stereotyping that has infected the $500 billion per year sports business industry. It would be great if pro athletes would really support an effort to cause the NCAA and its member institutions, which make billions off of the athletic talent of mostly black athletes, to address the systemic failures in the education of black athletes and the massive academic fraud that continues to be committed against black athletes. Using Black studies as the vehicle to commit the academic fraud just adds insult to injury. "Black lives matter" is no less true when it comes to the mis-education of the tens of thousands of black boys who populate college basketball and football rosters across the country. What about the persistent disparity in graduation rates between black and white athletes? Aren't these inequities the result of similar and negative stereotypes? Are they best explained by black men's fascination with playing for the NFL and NBA, or is it that coaches and institutions only care less about graduation rates than whether players are academically eligible for athletic competition? Why not unite and support a response to challenges that are being mounted daily across the country to any consideration of background, including race, in the college admissions process? After all, black males represent only 2.8 percent of undergraduates, but 54.6 percent of football players and 60.8 percent of basketball team members at the 76 institutions comprising the six major sports conferences: the ACC, Big East, Big Ten, Big 12, Pac 12, and SEC. And if economics is truly the "new civil rights movement", then why not look beyond race and policing and also target the interlocked issues of race and money in sports? There are $500 billion reasons why black athletes need to join forces with black professionals so that those who are "doing the plowing and the threshing" more meaningfully share in the harvest. Black athletes know what needs to be done. All that is missing is the will to do it. Now is the time to dispel the stereotypes about black athletes. Here's betting they'll discover that you only get "black-balled" when you lose a step, or that burst. Take a stand and you create a legacy. 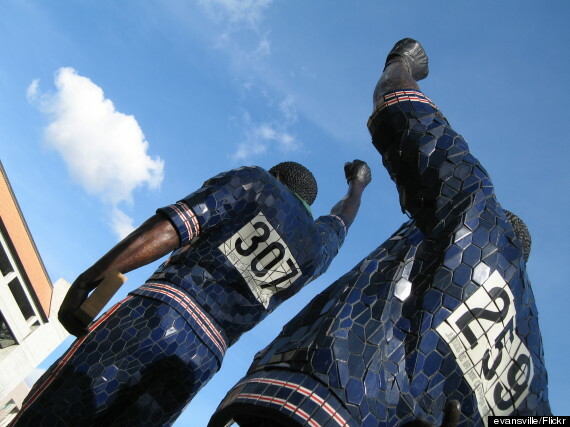 Why else is there a statute at San Jose State capturing the iconic moment Tommie Smith and John Carlos staged their protest at the 1968 Olympics, the Muhammad Ali Center (with statute) in Louisville or the Bill Russell statue in Boston's City Hall Plaza? Please, no more waiting to exhale.